Forrester, who invented random-access magnetic-core memory during the first wave of modern digital computers, also pioneered the field of system dynamics -- analysis of the behavior of systems. 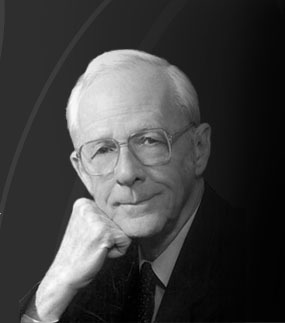 He pursued three main interests based on system dynamics: the System Dynamics National Model, which generates the major observed modes of economic behavior; a new management education that is based on the inherent, dynamic complexity of all the related parts of a corporation and that brings them into a unified system; and system dynamics as a methodology for giving cohesion, meaning, and motivation to pre-college education. Jay W. Forrester was the Germeshausen Professor Emeritus and Senior Lecturer at the Sloan School of Management, Massachusetts Institute of Technology. He began his career as an electrical engineer working on servomechanisms and large-scale digital computers. While Director of the MIT Digital Computer Laboratory from 1946 to 1951, he was responsible for the design and construction of Whirlwind I, one of the first high-speed digital computers. In 1956, Professor Forrester started the System Dynamics Group at the Sloan School and with it, the field of system dynamics. He was also the director of the System Dynamics in Education Project (SDEP), which developed ways to use system dynamics and computer modeling as a foundation for a new kind of kindergarten through 12th grade education. The SDEP project at MIT wrote Road Maps which is a guide to learning system dynamics. As Dr. Forrester's career progressed, he realized that the real power of system dynamics would only be realized if students were exposed to it from an early age. In 1991 he and John Bemis founded the Creative Learning Exchange in order to support and encourage the use of system dynamics and learner-centered learning in K-12 education. He continued to encourage and support the K-12 initiative for the rest of his life. He was the guiding light for the work that is being done in K-12 education. Click to see a more detailed biography of Jay W. Forrester (D-3110-14). Presents views on how system dynamics may improve classroom learning. There is a fundamentally different kind of pre-college education that the author, along with many others, has been pioneering for more than twenty years. The demonstration phase is now completed and it is time to launch a major implementation program to expand into a growing number of schools. This is a long-range and difficult undertaking but necessary if K-12 schools are to produce citizens who are prepared for the challenges of the future. In its full development, system dynamics is a discipline with the scope of science, education, law, engineering, or medicine. On the other hand, it is becoming clear that teachers in ordinary K-12 schools can make enough progress in two or three years to achieve major improvement in students’ thinking, self reliance, and enthusiasm for learning.This paper gives a glimpse of the principles and concepts that make up an understanding of complex social and economic systems. With these notes, Jay Forrester hopes to encourage discussion about participating in a daring, difficult, but highly promising kind of K-12 education that is radically different from what is now common. Fifty years after its creation, Professor Forrester reviews the current status of the field of system dynamics and assesses prospects for the next fifty. Forrester focuses on the challenges the field must face if it is to realize its potential. English version of the paper Prof. Jay Forrester presented at the University of Seville on December 15th, 1998. This paper talks about how Dr. Forrester believes system dynamics will help in understanding the many complex systems in our society. Spanish translation of the paper Prof. Jay Forrester presented at the University of Seville on December 15th, 1998. This paper talks about how Dr. Forrester believes system dynamics will help in understanding the many complex systems in our society. A paper introducing the concepts and applications of system dynamics. Forrester discusses social policies and their derivation from incomplete understandings of complex systems. Also appears as Chapter 14, pages 211-244, in author's Collected Papers 1975; and as Chapter 1, pages 3-30, in Toward Global Equilibrium: Collected Papers, 1973. Also in Road Maps 1. This paper discusses system dynamics as a solid systems core in K-12 schools. It originally appeared in Reflection, Journal of the Society for Organizational Learning, Vol.1, No. 3, Spring 2000, published by the MIT Press, as a response to Peter M. Senge's article in the same issue entitled "Systems Change in Education". Revised 12/2010. Over the years, the CLE has been fortunate enough to have gathered a variety of videos with Jay W. Forrester. These videos touch on climate change, the history of system dynamics and more.